Frontline Rail Leasing supplies equipment to various railroads and industries. A simple facility, this plan nonetheless offers some unique operational and modeling challenges. It’s designed to handle up to 70 foot freight cars and 6 axle diesel locomotives with ease. The plan and facilities shown could cater to either the freight car or locomotive enthusiast, offering interesting opportunities for both. A small stub track allows the layout to be swtiched with the Trackmobile without an accompanying cassette. The cassette itself is 2in by 20in and can handle two 70′ freight cars or three 50′ freight cars. The cassettes are stored under the layout on the interchange end. The layout itself measures 12in wide at one end, and 10in at the other, and is 48in long. Operation depends on the equipment used. Equipment requiring repainting or repair will form the bulk of the movements. 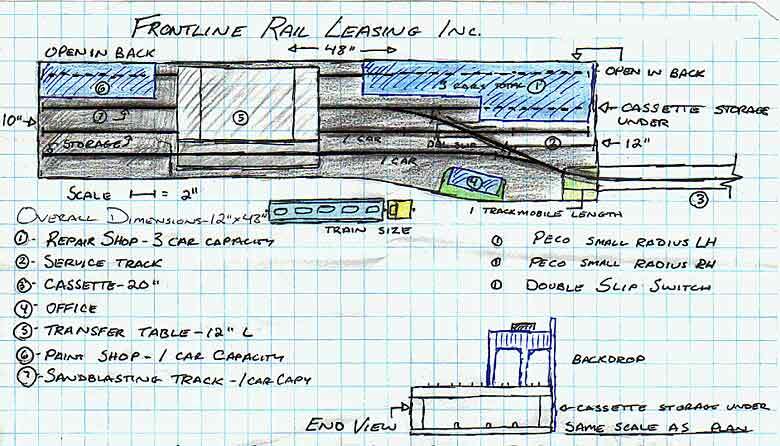 For a loco shop, the odd flatcar loaded with trucks or a prime mover could be brought in. The centrepiece of the layout is the transfer table. This could either be a commercial model or scratchbuilt. Turnouts shown will need to be trimmed to fit. Overall, this is an excellent showpiece for both models and the Trackmobile.